GOOD JUDGES reckon fans at John Smith’s Stadium may have been in at the start of something special. Last Friday’s 28-20 defeat by Huddersfield Giants was yet another disappointment for Leeds Rhinos in what is becoming a disastrous season. But one positive was the performance of several young players in the team, who are getting their opportunity because of Rhinos’ horrendous injury crisis. Mid-way through the second half, 17-year-old forward Cameron Smith came off the bench for his Super League debut and he is a player already tipped as having the potential to go to the very top of the sport. The younger brother of Huddersfield’s ex-Leeds academy prop Daniel Smith, Cameron has been an outstanding player through the various age groups and got his senior chance just months after stepping up from under-16s level. Smith missed around a month of academy matches to bulk up as Rhinos’ coaching staff prepared him for a taste of Super League. Rhinos are wary of rushing Smith and he knows time is on his side. Looking ahead to the rest of the season, he said: “Hopefully I will get as many training sessions as I can with the first team and keep learning. “I will still keep playing with the academy, but just being around the Leeds first team is massive for me. “I am just trying to get as much experience as I can and learn from the players that are in front of me. “With it being a physical game, for me to be 17 and play week in and week out I reckon that wouldn’t be the best option for the moment. Smith, a former Castleford High School pupil, is not yet full-time, studying a BTEC sport course at college and fitting that around training with Rhinos’ senior squad. 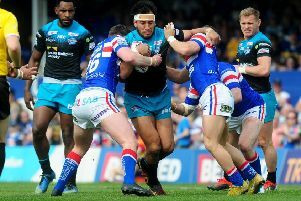 Daniel Smith played for Rhinos’ academy, without making a first team appearance, After a spell in Australia he spent two seasons with Wakefield Trinity Wildcats before moving to Huddersfield. “He has helped me,” Cameron said. “He gives me some tips and he is always cheering me on, which is a big help.” The elder Smith brother is on Giants’ casualty list after being injured in their defeat at Leeds earlier in the season. “It would have been some experience making my debut against my brother,” Cameron said. Rhinos’ under-16s and under-19s both won at the weekend. Kieden Hartley, Tom Holroyd and Eddie Wilcock crossed in the under-16s’ 18-10 victory at St Helens and Harvey Spence kicked three goals. Try scorers for the under-19s in their 30-28 success at St Helens were Tommy Brierley (2), Sam Hallas, Josh Jordan-Roberts and Ben Brady.